While running along the Boulder Creek Path today in shorts and short sleeves, I was trying to wrap my head around the fact that it’s early December on the Front Range in CO. Normally I would be trying to find a matching pair of gloves this time of year – and while enjoying the warm sun my mind started to drift to a poster presentation one of my colleagues is presenting this week at AGU: “Automated Mapping of Rapid Arctic Ocean Coastal Change of Large Spans of Time and Geography” by David Hulslander. We usually think of climate change on a global scale. However studying regional changes, especially those areas more sensitive to climate change, can provide great indicators of broader phenomenon. In fact, take a look at the summer ice retreat interactive graphic illustrating the unprecedented loss of Arctic sea ice. This graphic delineates a perennial sea ice coverage boundary (since record keeping began in 1979). If you drag the slider, you see that only in very recent time do we see open water within this boundary. 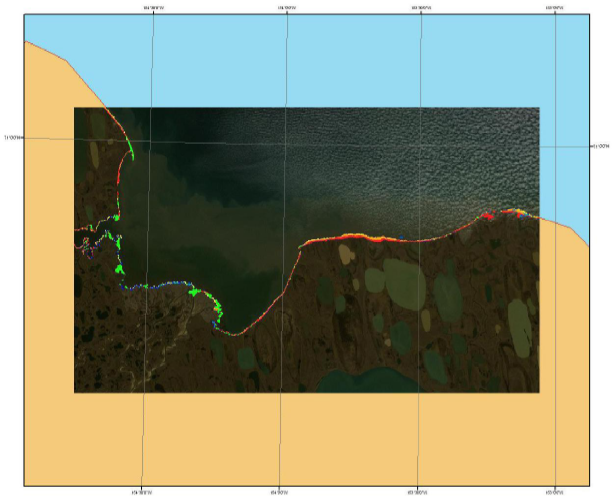 In Dave’s poster at AGU you will see compelling graphics (like the one above) illustrating rapid coastal erosion in this Arctic area - along with the methods, results, and discussion to arrive at this conclusion. Using freely available Landsat data as input to an object-based feature extraction, the coastline is delineated in an automated fashion. Erosion is quantified by looking at thematic change results of areas that were once land and are now water. For a closer look, visit Dave at AGU this week or download his poster.